When you create a new Brainstorm or Interview project, you never know how many ideas you are going to get. You sent your request over the weekend or during the holidays and most people were away or too busy to brainstorm! In many cases, MyBlogU members may be unsure what you expect, so they just shy away from contributing. Not only will this help more people understand what you mean, this will also bump your project on top giving it more visibility. Please make sure the project is submitted to the most relevant category: Our users are subscribed to the categories they specialize in, so once you change the category, this project will get included in the next email digest. Sometimes one project can fit into several categories, so it’s a good idea to give one category a chance for a couple of days and then try changing it to another one. Please contact us and we’ll help find some experts! Our mods will get back to you with some recommendations on how to edit the project to make it clearer. They will also suggest your project to some interested folks to help generate some buzz. What To Do with Ideas that Keep Coming? Do you have your own tips on how to generate more ideas using MyBlogU? Found some hacks? Please share them! Why Cannot I Archive a Project Without Approving / Rejecting Ideas? Let us first explain why we require approving / rejecting all the ideas before archiving the project: We strive more communication between the project owner and the contributors. If you could shelve a project with active ideas in it, it would be too easy to forget about ever updating the contributors on the status before starting a new project. MyBlogU members help each other for free: The least you can do is to reply to them promptly saying if you think the idea or the quote would work for you. You don’t need to use the idea in content right now: We understand that brainstorming and inspiration often need time before they result in the content. Approving an idea is a way to say “Thanks”! If you cannot provide a link to the published content now, you can still approve the idea (Thus giving the user heads-up) and say that you’ll provide the link later. Add a “To-Do” item with the future article title. 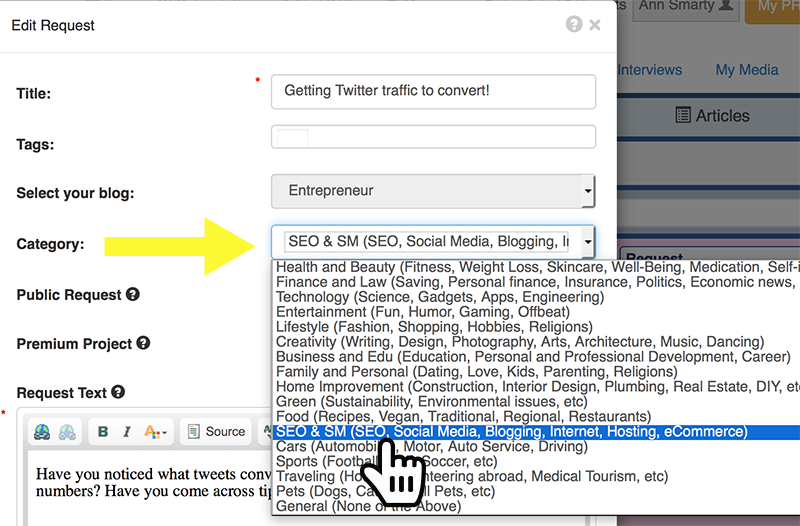 Also, using “To-Do filter”, you’ll be able to find those ideas you were planning to use in that article! Once your article is live, you’ll go to your brainstorm archive and use “Provide URL” field to copy-paste the URL. This will send another email to each user automatically! Yes, these steps mean that you’ll need to go back to update the status a few times but keep in mind that someone may be waiting to hear from you on what they contributed. Let’s keep each other updated! The more communication, the stronger the relationships! That’s what’s building our community! How to Use MyBlogU “Brainstorm” Feature? 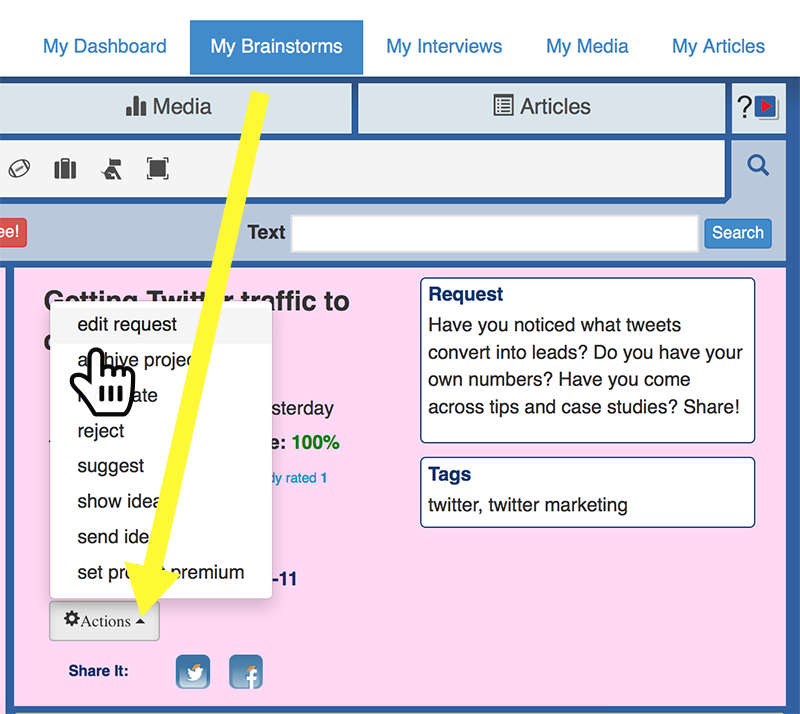 “Brainstorm” feature is pre-moderated meaning that the editors will be reviewing your request and, if necessary, ask for revisions. We might reject your request because we prefer this section to feature more established sites and bloggers. If your blog is new and you were rejected, please don’t be offended: Join our forums and we’ll help you grow! The best thing about MyBlogU “Brainstorm” feature is that it’s really flexible. You get to decide which kind of help you really need. This section will be largely improved over the next future months. See some ideas we are going to work on here. 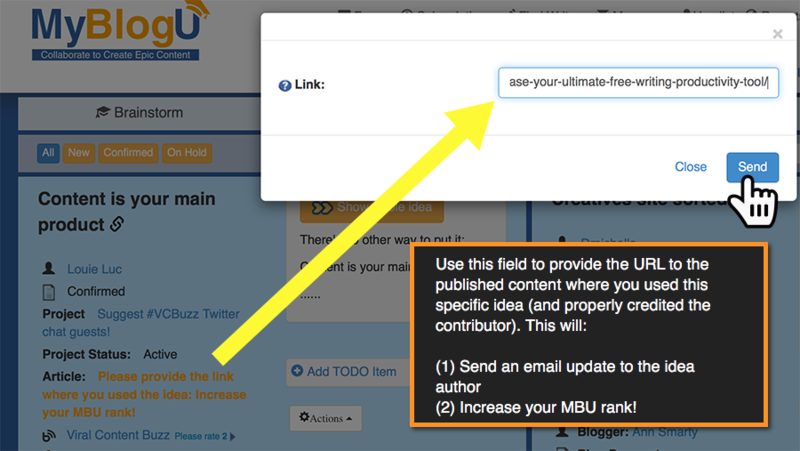 Please tweet your feature ideas to @MyBlogU and they will be added! 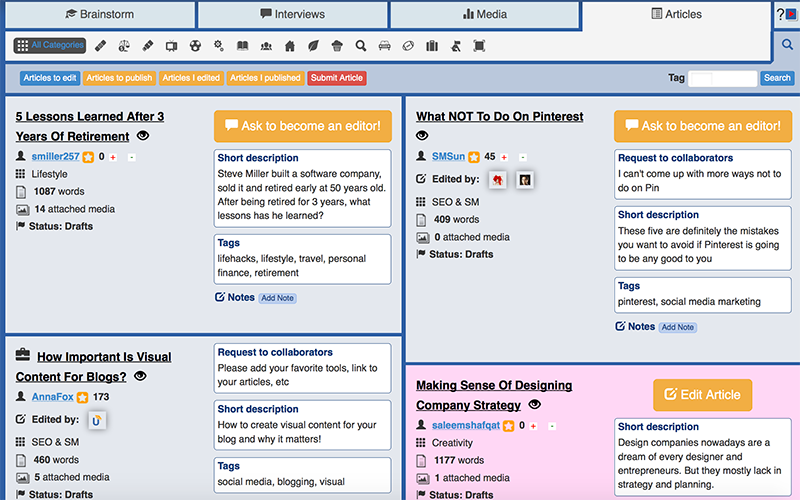 MyBlogU Brainstorm is the free feature that lets you crowd-source your content ideas. Use it whenever you hit the writer’s block or whenever you feel like you need a more unique angle. Nowadays that everything has already been covered, it is hard to stand out. The “Brainstorm” section of MyBlogU helps you pick other people’s brains and get inspired. Additionally you can help others brainstorm as well and get cited for being helpful! Also add as many tags as you feel necessary. Remember that a good description and relevant tags will help our members to find your request. 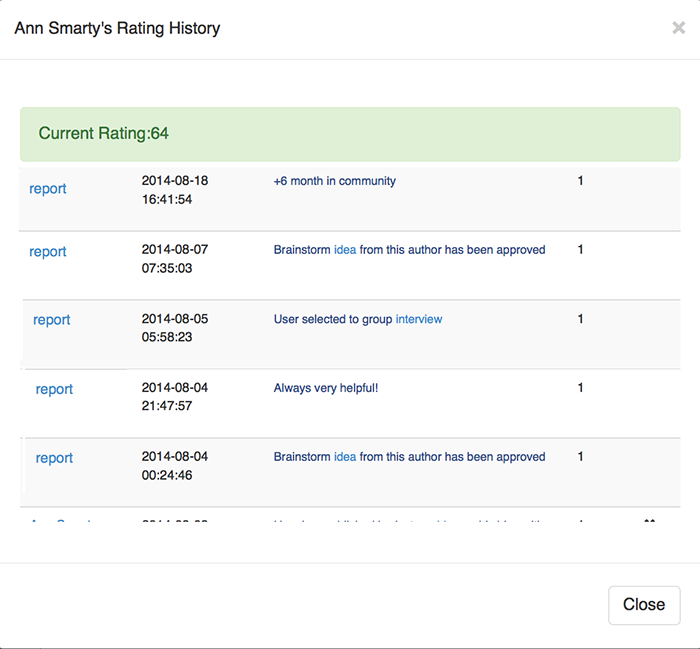 Once your project is added, a moderator will review it to make sure it looks good and most likely approve it. Once approved, you project will start receiving ideas. Feel free to keep your project active for as long as you want. You are likely to get quite a few ideas for writing several articles thanks to our members. Mind that all the approved and rejected ideas will be saved in your archive, so you can always get back to the collection to re-use any. Please do approve any idea that you use in your articles. This way you will notify the users of your published article and encourage them to go ahead and share it across their social media accounts. We want you to both get inspired and build traffic and relationships as well! You can also help others: Just browse the Brainstorm section of MyBlogU and see where your expertise and experience may come in handy. Feel free to share related links, stats and screenshots. For example, you could share a screenshot of the interesting Google Search result and suggest the author write about all different ways Google gives your instant answers right within the search results. Isn’t that a great idea? Let’s brainstorm together! Together we are better and stronger! Send Ideas through MyBlogU Brainstorm: Best Practices! Are There Any Requirements for Blogs Starting Brainstorm Projects #MyBlogU? => Visual appeal is highly important for the success of your content; therefore adding useful cheatsheets and infographics is so essential. Our platform is still being developed; you can check our plans and status updates here. Expert Interviews: How to Use MyBlogU Group Interviews Feature? Group expert interviews section is the great source of free content to enhance your article as well as connect to industry experts and content creators. Group expert interviews are a great way to connect to influencers, build you brand and diversify your blog content. On the one hand, it’s a great way to add high-quality (and trusted!) 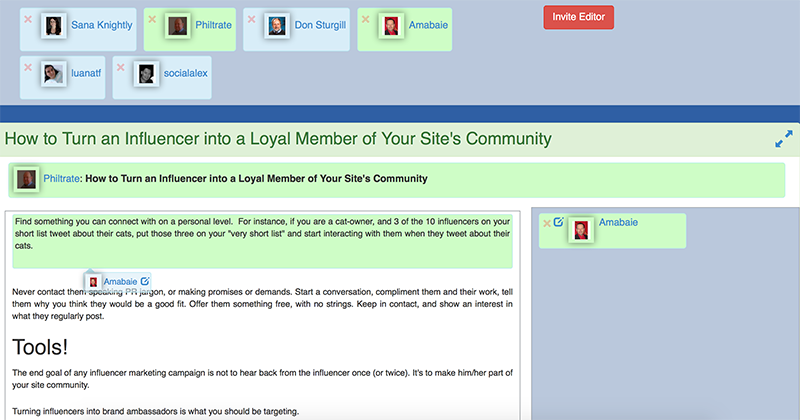 content to your blog while engaging those people who shared quotes to promote it. On the other hand, being featured in the group interview is a great way to build your personal brand and get cited. 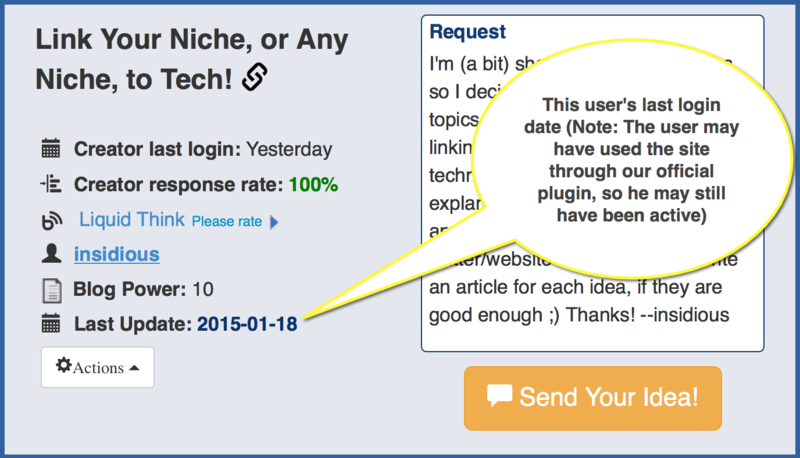 MyBlogU “Expert Interviews” feature makes collecting quotes and participating in group interviews much easier. Then please add the actual questions that our members will be answering. Don’t add too many questions, as members will not answer all of them. Mind that MyBlogU group interviews feature can also be used to get a quick quote for your upcoming article to make it look more trustworthy and professional. Only answers longer than 200 words will go through the built-in duplicate content checker to make sure they are original, so we encourage our members to check the originality using a search engine. To do that, simply grab a sentence from the answer, put it inside the parenthesis and search your preferred search engine. Once you publish your interview or your article containing quotes, provide the URL inside MyBlogU. This will notify our users of the published interview and encourage them to share it with their social media followers! Here you go! 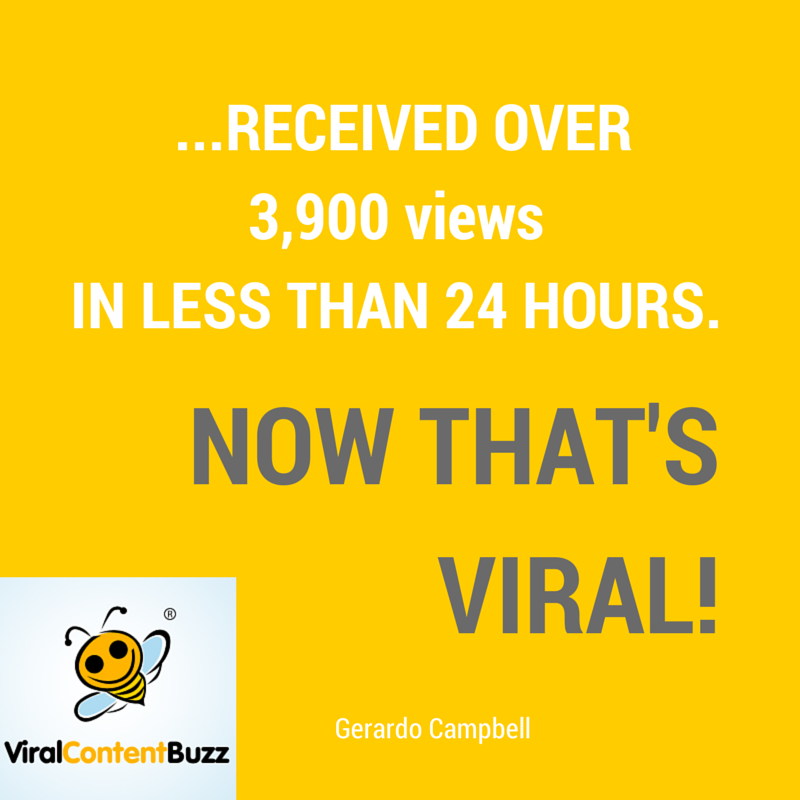 You have a cool, viral and original article for your blog! That’s a great way to build readership and traffic! Go through the available interviews and click “Add your answers” button. You’ll need to first specify your name, title and site URL – these will be used for quote attribution. You can select a question (or a few questions) to contribute to or you can answer all of them. When typing your answer, keep an eye on the word counter to stay within the specified word limit. Once your interview is live, don’t forget to share it with your micro community via social media! The best part is, this feature is absolutely free! Having grown a few communities, I must admit this is something we’ll have to accept. People get sick, blown away by day job, busy… they may have personal issues, they may have gone away traveling,… There are so many reasons why people may go MIA..
That’s something that’s going to happen and please don’t feel bad about those fellow community members. After all, we never know what’s holding them back! This feature has been suggested by our brand ambassador @YoavEzer and we love it! We give any project 2 weeks: If the project creator hasn’t replied to any ideas after that, his/her “Response rate” drops. Once the pending ideas are reviewed (Approved, rejected, requested a follow-up), the response rate grows. So if you know today’s date, it will be easy to figure out if the user has recently logged in to the site. Note: The user may have used the site through our official plugin, so he may have been active without actually logging in. 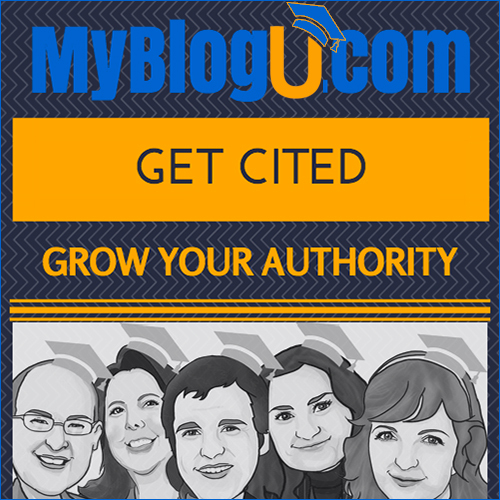 MyBlogU User Rank consists of lots of actions this user has taken, including the ideas and interviews he/she published (NOT just reviewed but actually marked as published). This is a great way to tell how actively the user has been reviewing and publishing MyBlogU users’ submissions! Emails may go to spam. PMs are easy to miss as well. An alternative method to follow-up may be a good idea. Plus, you’ll get a chance to make a friend with that person on social media! Our team will be happy to help you get in touch with MyBlogU users. Our powers are still limited but we’ll do our best! If you have more ideas on how to minimize non-response cases, please let us know! Collaborate on Article Drafts: Introducing #MyBlogU Articles! Go ahead and upload it to MyBlogU Articles section and add your own comments what kind of help you are looking for. 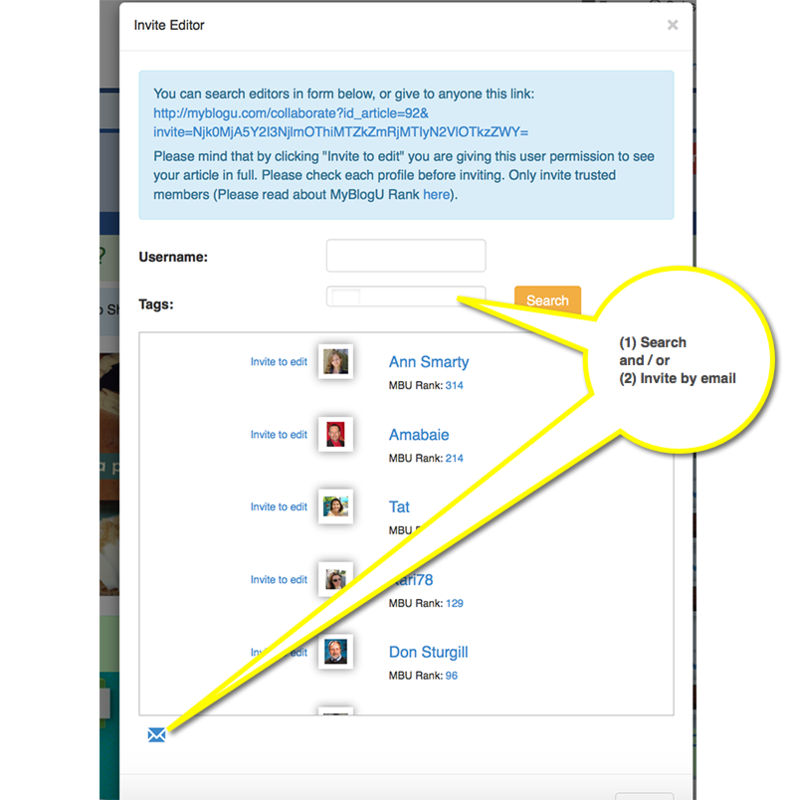 Once your article draft is saved there, you can easily invite collaborators and editors: Search MyBlogU users by tags or choose from best-rated members. You’ll also get editing applications from users you didn’t invite but you’ll be able to approve / reject any! The invited and approved collaborators will start sending you notes and suggest snippets of text to add to the article. You’ll be able to approve (and edit if needed) all the notes or reject them. All approved snippets will be added to the final HTML code which you can grab to publish on your own blog or elsewhere at any time. Finding people who care about your article! Once an editor’s note is approved, he/she becomes the approved collaborator which means he/she will get automatic email once your article goes live anywhere on the web. This means, they will go ahead and share your article around and comment on the actual result of that collaboration. That means, you’ll have people who care about your article: You are no longer alone! You’ll see more shares and interactions for your MyBlogU collaborated content than any other content you published previously. You’ll learn to love your blog again!